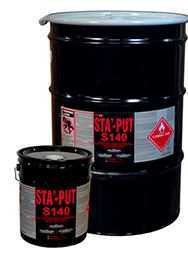 STA’-PUT S140 is a solvent-based, brush grade contact adhesive designed for industrial applications bonding a wide variety of materials including decorative laminates, plywood, particleboard, polyurethane foam and rigid plastics. S140 exhibits excellent heat resistance, is postformable, and has an extremely high ultimate strength. S140 also offers high solids, long open tack, and bonds are resistant to humidity, water, and oil.